A number of weeks back I wrote a glowing review of Wantsûchi, a local branch of a tantanmen and Chinese food chain, proclaiming their black sesame noodles properly spicy and tasty, and full of Sichuan flavor. About a month or so back, Wantsûchi put up a big sign announcing an "all-new menu" - I can't say I was too excited about this development, since I had been hoping to go back and work my way through the myriad tantanmen options. Fortunately, "all-new" wasn't entirely true, and the menu core of tantanmen and fried rice stayed, while some of the extra permutations were eliminated to make room for the addition of more standard ramen varietals like miso and shôyû. It was still the New Years Holiday and even the fast food restaurants were closed, so I decided to give Wantsûchi's noodles another whirl. One eye-catching menu item was the rather mysterious sounding "rugby rice," which amounts to a full kilogram of fried rice. The cooks seem to be contractually obligated to ask the customer before taking the order "you are aware that this is 1 kilogram of rice, are you sure that is OK?" I went to Wantsûchi for fried rice and beers a couple weeks back with one of the bigger eaters I know, and even he couldn't make it all the way through the rugby. 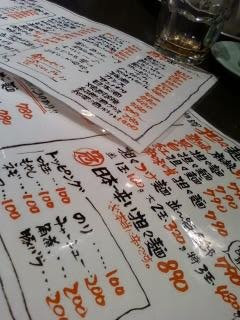 There are also some set menus featuring dishes like pan fried pork and liver with leeks. 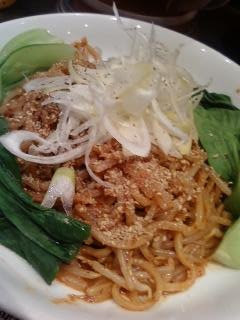 In the noodle department, although the new menu was missing some of the old's tasty-sounding options like spicy takana (pickled mustard greens) tantanmen, the real test was whether the cooks had mucked around with the recipe and if the tantanmen would still come correct with the same Sichuanese punch. 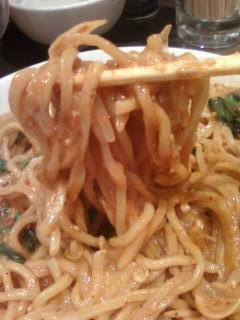 This time I decided to go with the mala jiru nashi men (Hot and Numbing Soupless Noodles). I've never figured out the whole story, but something about Japanese egg safety standards are much higher than American standards, because I've never heard of any danger from eating raw eggs in Japan, nor have I heard of anyone getting sick. 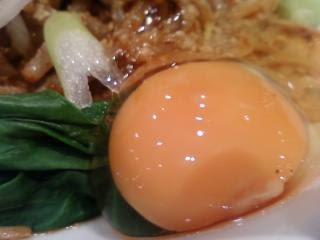 Raw egg over rice with a little soy sauce is a classic dish (especially among poor students), and numerous dishes involve a raw egg cooking halfway via the heat of the other foods. In any case, I mixed that egg up good and it gave a nice bit of thickness to the tasty sesame and chili oils that give the dish its flavor. As with my last bowl at Wantsûchi, these noodles had full-on Sichuan flavor. There was definitely plenty of la (hot chili spice) and no shortage of ma (flower pepper numbing spice), the two crucial tastes in a dish like this. For some reason, the spice seemed to hit a little closer to the back of the mouth than usual, but my lips were abuzz in only the way that eating plenty of huajiao (flower peppers) can make them. Better than plenty of poseur bowls I've had in Beijing, though (of course) not up to the Chongqing standard; I'll do a post sometime about Chongqing noodle memories. These were "extra thick" (gokufuto) noodles and were properly chewier (mochi mochi) than most, which was definitely a bonus point. The only negative is that I was left slightly less than fully sated, as seems to be the case with soupless noodles - none of that extra liquid and oil to fill the belly all the way up. Nonetheless, I was relieved that Wantsûchi kept their stride through the menu change, and I'll probably end up trying their other tantanmen bowls before the year is out.